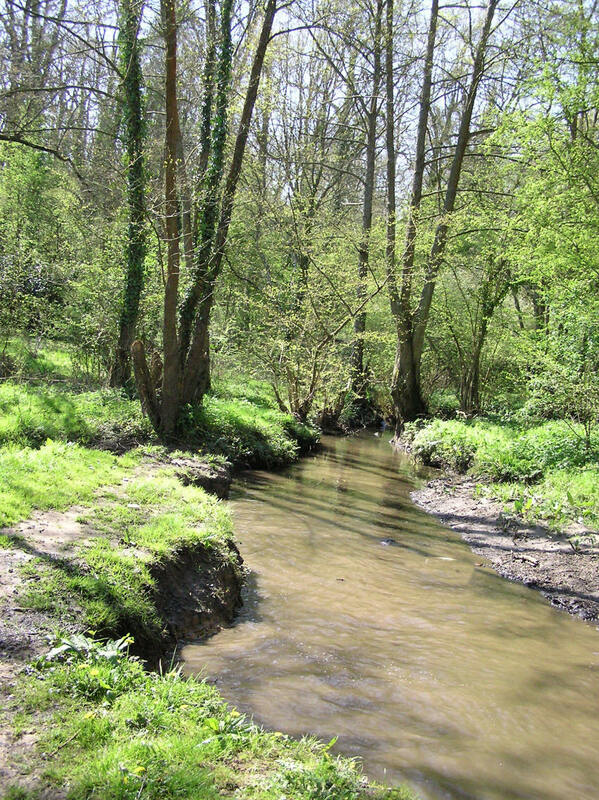 The Hookheath Meadows nature reserve is leased to the Hampshire & Isle of Wight Wildlife Trust by Southwick Estates. It's an area of unimproved meadows, scrub and woodland with some very fine wildlife on site. 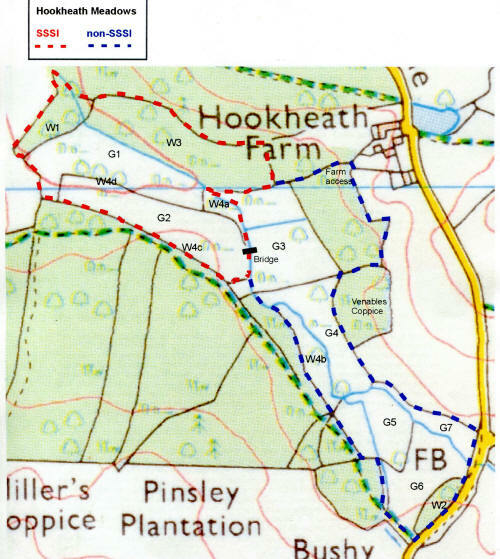 Part of the reserve is a designated Site of Special Scientific Interest (SSSI) as shown on the map by the hashed red boundary line. There are distinctly different habitats but all have botanical interest. Some areas have significant invertebrate life and their are also interesting birds to be seen at times. There is a public right of way through the entrance area of the reserve and then through the coppices to the south of the reserve. This path is good for spring flowers including ransoms, bluebells and moschatel. Fungi can be good in the autumn. The first meadow from Pigeon House Lane (G6 on the map) is a fairly dry grassy area which gets wetter as you walk down towards the stream at G7. It has recently been mown and is much better shape than it was a few years ago. The key wildlife feature of the meadow is the southern marsh orchid (right) show in late May and June. If you walk down through this meadow, avoiding wandering off the path too much please, towards the stream you will find a choice of paths - one through G5 and another along the stream. The latter is dry and firm. The former is usually quite wet. The wet patch leading into this meadow usually has some brooklime from June onwards. The meadow at G5 has a dense cover of corky-fruited water dropwort interspersed with yellow flag, ragged robin and in season more southern marsh orchids. The fine stand of alder trees along the stream are often used by flocks of siskins and redpolls in the winter months. Almost anywhere along the stream from May onwards you may find beautiful demoiselles. The males are superb as they fly in and out of the sun showing the gorgeous blue wings in the sun. The wooded area south of the stream (W4b on the map) has recently (2011) been cleared of some trees to open it up. Take care walking through this area as the path has many tree roots forming trip hazards. From late March into April you can find extensive area covered with the scarce opposite-leaved golden saxifrage. There are also rare ferns here like hay scented buckler fern. The dry meadow is a good place to search for butterflies - particularly silver-washed fritillaries, white admirals and , if you are lucky purple hairstreaks. Look for the first two on the brambles along the path and the hairstreaks on the oaks. Common spotted and hybrid orchids can also be found. The wet meadow is great for orchids, heath spotted and southern marsh, and other wetland flowers like yellow flag, ragged robin, sneezewort and corky fruited water dropwort. Meadow thistle also grows well in this meadow. This is a great spot for dragon flies and I am told micro moths. I have seen a hobby hawking here for dragonflies. From the western end of the meadows you can return along the path to the gate into the SSSI or the style from where you can either retrace your route in or walk up to the public right of way through the coppices. I have yet to explore W3, G3 and G4 and will not be adding anything to this page until I've seen them in spring/summer. At present (March 2011) they are very wet and there is little there to see. English white cattle that were on Hookheath from August through to October and did a great job grazing G1,2 and 3. The latter for the first time for ages.